Introducing GoConqr- an exciting new online study platform from Software4Students. GoConqr is a new platform designed to help students develop, understand and learn key concepts, topics and subject matters. It’s delivered through an online portal meaning it is easily accessible and available to you at any time and location. With GoConqr you can create visual study content to aid your learning process and help you remember your study notes better. Use our free Mind Map tool to connect the dots when you study. GoConqr’s Mind Map feature allows you to present ideas and concepts in a visually appealing and easy-to-understand way to help you comprehend how the pieces of the study jigsaw fit together. 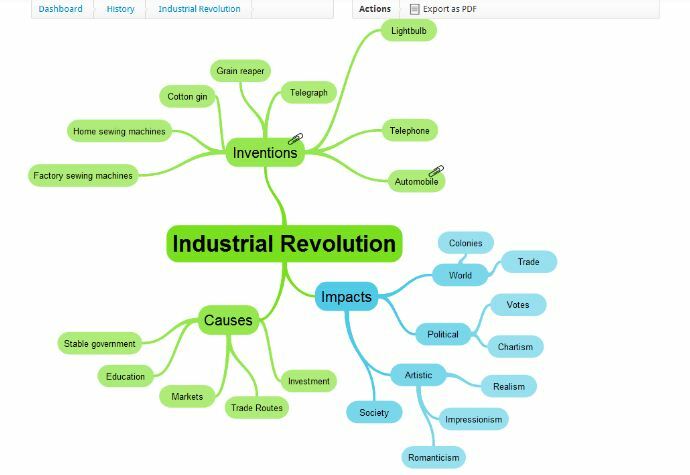 Whether you are brainstorming with your classmates or mapping the main concepts connected to the industrial revolution, displaying the information in a Mind Map helps you understand and make connections easily. Mind Maps are ideal tools to use for improving your study time as visual content has been documented as helping you memorise information. These study aids can also be used as revision planners to help you organise and plan the time you dedicate to study. Create a Mind Map to plan the structure of an essay for example, each strand delves deeper into one area and once you have delved deep enough you can zoom back and connect the dots between the different areas you may not have noticed are connected before. You can also attach snippets which you can fill with notes, pictures or links to any other resource which you feel helps your mind map. You can then share your online mind map with friends or even print it if you wish! Our free mind map software allows you to create an all-encompassing map that you can tailor, on the go, to fit your needs and help you study.